What's the hardest part of running a game? It has to be the preparation. You can't just spontaneously say, "Let's play a roleplaying game" unless someone's already spent hours to prepare an adventure for the group. But what if running a great game didn't require any more time for the game master than it does for the players? Weird Discoveries makes prepping for an RPG no more difficult or time consuming than setting up a board game, while showcasing the wonder, mystery, and awe of the Ninth World. 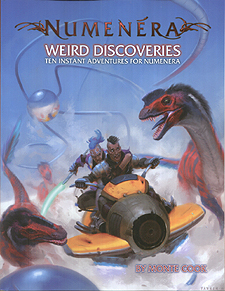 This is a must-have for beginning and veteran Numenera GMs. These aren't adventure seeds - they're complete adventures in an innovative format that requires minimal prep. Run them as one-shots, or drop them into your ongoing campaign when you don't have time to prep your own adventures. You can even run them together as a campaign for months of effortless play! A whole new format for adventures that addresses the needs of GMs who don't have time to read the whole thing before sitting down to play. Twenty beautiful, full-colour Show-Em illustrations, to reveal to players during the adventures. Six pre-generated, illustrated characters, ready to play.